I thought it would be rather timely to put together a capsule holiday wardrobe for men, since I have already put together how to build a capsule holiday wardrobe for women. My menswear section rapidly got turned into my wedding category on the website once I got engaged. So it isn’t often that I feature any menswear. 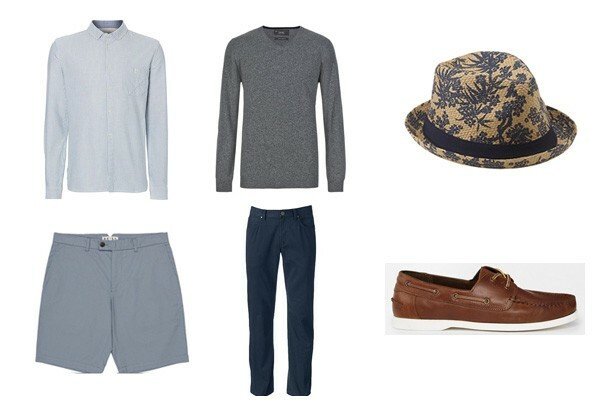 Summer is the perfect time to guide the men into how to style their holiday wardrobe. If you are heading off to the sun for a few weeks with your darling boyfriend/husband/lover or you are one of my rare male readers; here’s a little style guide as to the perfect capsule wardrobe for holiday season. I was inspired to write this having seen this gorgeous printed Trilby hat in John Lewis‘ Edition magazine. From that I built up a selection of wardrobe essentials for the travelling man this season. Chinos will take him from the city break to dinner just with a change of shirt. Debenhams have a good range. Boat/deck shoes – you can’t go wrong in, whether you are actually taking to the water or off to watch the polo or tennis. These leather ones above are from Asos.com. Shorts – tailored and sophisticated will work with a polo shirt in a Mad Men style at the outdoor cocktail bar or at the beach with the kids, I love the hue of these ones from Reiss. A cashmere knit is essential when the sun goes down. Even if just draped over the shoulders; it will add a little French charm to an outfit and of course can keep you warm. A V Neck one like the one above from Marks and Spencer works well for summer. A smart casual shirt will cover all sorts of occasions. Whether worn with chinos for a relaxed dinner at the local taverna or with shorts for the family bbq when the sun is shining. Linea always have a good range at House of Fraser. I love a hat on a man. It’s quite a rare thing these days. In the summer sun it is a sensible idea. 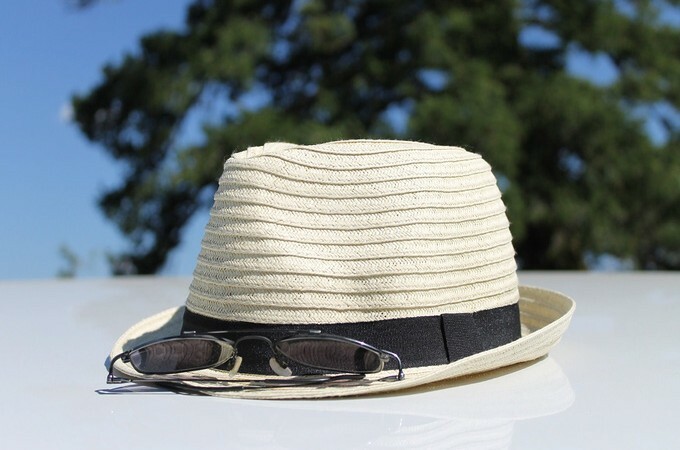 So whether you are city breaking or heading to the beach; this hat will keep any man cool.